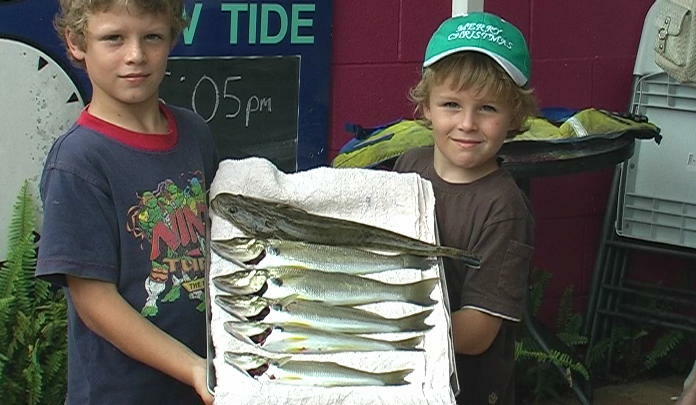 NOOSA: A few yellowtail kingfish to 12kg from Noosa National Park. Trevally and mangrove jacks in Noosa Sound and Woods Bay. Flathead and bream from Munna Bridge. Trevally and jacks on surface poppers in Weyba Creek. MAROOCHYDORE: Two jacks between 1 and 1.2kg from the cane bridge up stream over night. Another 1.1kg jack from up Petrie Creek overnight. Crabs in the creeks. Bream throughout the river and a few grunter in the deeper holes. KAWANA: Trevally and mangrove jacks over night around the bridges and other areas holding bait. Plenty of bream around the moorings and the canals and a few muddies in Mountain Creek. Sand crabs and whiting to 38cm in the Basin. CALOUNDRA: Flathead, bream and whiting inside the Caloundra bar. Jacks in the Pelican Waters Canals, in Currimundi lake and off the Boardwalk. Cod, jacks and a few grunter from Coochine Creek. Brian McCurrie was fishing with his mates up Petrie Creek over night last week, when this 1.2kg mangrove jack snavelled his live poddy mullet. 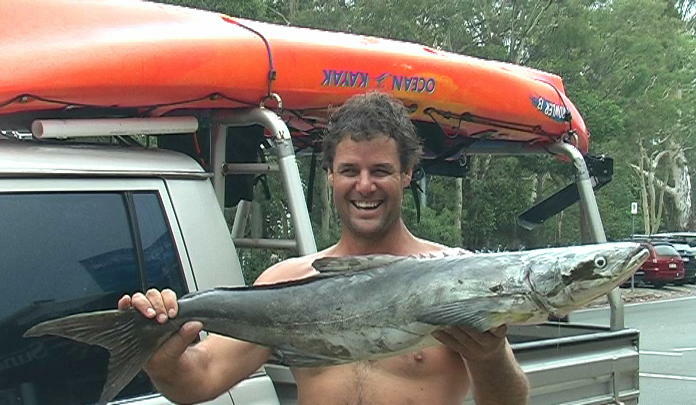 NOOSA: Whiting throughout the lower reaches and Frying Pan, also try around Goat and Sheep Islands. Trevally, mangrove jack and the odd flathead between Noosa Sound and Woods Bay. Mud crabs on the move in the creeks. Trevally and jacks on surface poppers in Weyba Creek. MAROOCHYDORE: Rough and windy conditions for beach fishing. A nice 2kg mangrove jack caught in the Cod Hole and another 3 jacks around Bli Bli. 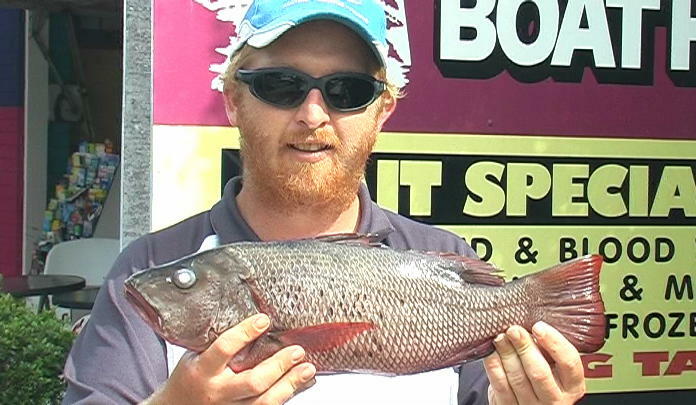 Flathead bream to 40cm and a 36cm grunter bream from the lower reaches, mainly around the Islands. Flathead and whiting also around the Bli Bli area. KAWANA: Trevally and mangrove jacks between the Wharf and McKenzies bridge and in the snags in Mt Creek. Plenty of bream around the moorings and the canals and a few muddies in Mountain Creek. Sand crabs and gar reported in the Basin. CALOUNDRA: Flathead, bream and whiting just inside the Caloundra bar. Jacks in the Pelican Waters Canals, Coochin Creek and at night along the Boardwalk. Trevally taking lures along the Boardwalk and in Currimundi Creek. Dave took this lovely cobia while trolling in his kayaks off Sunshine Reef with his mate Paul Andersen. NOOSA: Before the change in conditions Yesterday there was a good cobia and mackerel taken by kayak anglers off Sunshine Reef. Plenty of whiting throughout the lower reaches and Frying Pan, also try around Goat and Sheep Islands. Trevally, mangrove jack and the odd flathead between Noosa Sound and Woods Bay. Mud crabs on the move in the creeks. Try for bass and saratoga in the sheltered waters in Lake Macdonald and Borumba Dam. MAROOCHYDORE: Rough and windy conditions for beach fishing. A nice 2kg mangrove jack caught in the Cod Hole Yesterday. Quality whiting, flathead and a few bream throughout the lower reaches, and between Channel and Chambers Islands. Flathead and whiting also around the Bli Bli area. CALOUNDRA: Flathead, bream and whiting just inside the Caloundra bar. 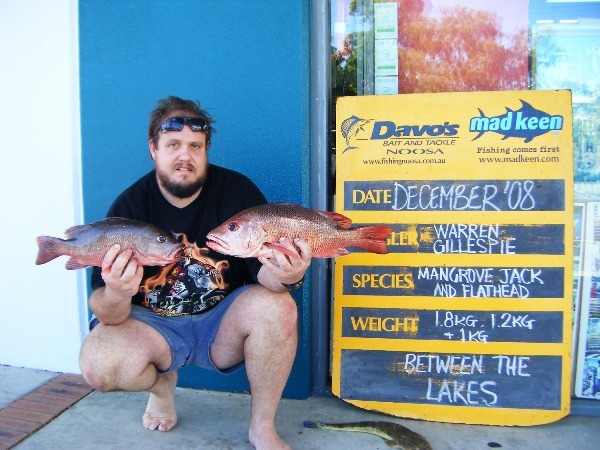 Try for mangrove jack in the Pelican Waters Canals, Coochin Creek and at night along the Boardwalk. Trevally taking lures along the Boardwalk and in Currimundi Creek. Young Brooke Spies learnt how to catch a feisty mangrove jack in the Cod Hole with his Dads help. MAROOCHYDORE: Plenty of beach species off Mudjimba and Marcoola Beaches early and late in the day when the beach goers are fewer. Quality whiting to 450g, flathead and a few bream throughout the lower reaches, and between Goat and Chambers Island. Flathead also around the Bli Bli area. KAWANA: Trevally and mangrove jacks taking flesh baits and lures between the Wharf and McKenzies bridge. Plenty of bream around the moorings and the canals and a few muddies in Mountain Creek. Sand crabs and gar reported in the Basin. CALOUNDRA: Flathead, bream and whiting just inside the Caloundra bar. Mangrove jacks in the canals, Coochin Creek and at night along the Boardwalk. Trevally taking lures along the Boardwalk and in Currimundi Creek. Young Ki and Jay Hargraves fished with their dad around Goat Island in the lower reaches of the Maroochy River for these nice big whiting. If the picture perfect conditions on the Coast the past few days are an indication of the weather we expect in the early new year – then there will be plenty of smiling faces from local, tourists and especially the fishing community – lets hope it stays like this! The light offshore winds and mild swell had plenty of offshore boaties tickled pink, nicely formed gutters along the surf beaches made for some excellent beach fishing and the river banks have been lined with kids, parents and grandparents all indulging in some family time while fishing in the glorious weather. However with the possible chance of rain coming up over the weekend – it would pay to make the most of it today and early tomorrow before we get a reprieve from the heat! If you are unable to make your mind up between shopping, beach-going or fishing today, then check out some of my suggestions listed below which may whet your appetite! Offshore: Highly recommended is the Barwon Banks – a bit of a longer trip than your local reefs but well worth it as this is the best feeding ground for pelagics, though the local reefs like Old Woman Island and the Inner Gneerings are fairing well also. The ‘Banks’ are easily accessible from Mooloolaba – but make sure you get out early before the sun’s full heat is beating down. If leaving from Noosa then head to Chardon’s, Sunshine or North Reef which are reporting good size dolphin fish, mackerel varieties and your standard reef species including pearl perch, moses perch and snappery-squire. Out the Caloundra Bar and to your right is Bribie, plenty of drop offs and reef structures to try within 5-20mins drive in a tinny. Queenfish, snappery-squire, parrot, perch, bigger trevally and occasionally amberjack and red emperor are the found here and also further out at Bray Rock, Caloundra Wide and Caloundra 12 Mile. 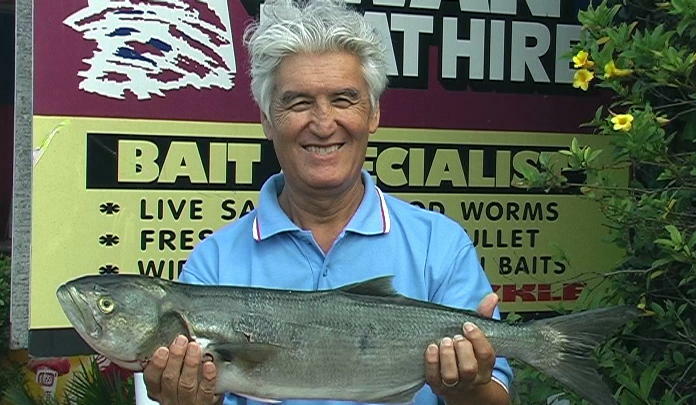 Rivers: All rivers will be boasting catches of whiting and flathead along the shallow banks and channel edges. The dropping tide will be best for whiting and flathead as the smaller baits and scraps float slowly over the banks. Schools of baitfish are provoking feeding frenzies from trevally, mangrove jacks and chopper tailor either side of the high tide – look out for bubbling or rippling patches moving along the waters surface. Be sure to source out fresh prawns or live worms for the sand feeders and get out your poppers, soft plastics and metal slugs for the baitfish followers. Swan Boat Hire would like to wish everyone a safe and happy new year – may your resolutions be achievable and your head not hurt too much in the coming days. MAROOCHYDORE: Plenty of beach species off Mudjimba Beach early and late in the day when the beach goers are fewer. Quality whiting to 450g, flathead and a few bream throughout the lower reaches, best just inside the river mouth, and between Goat and Chambers Island. Flathead also around the Bli Bli area. 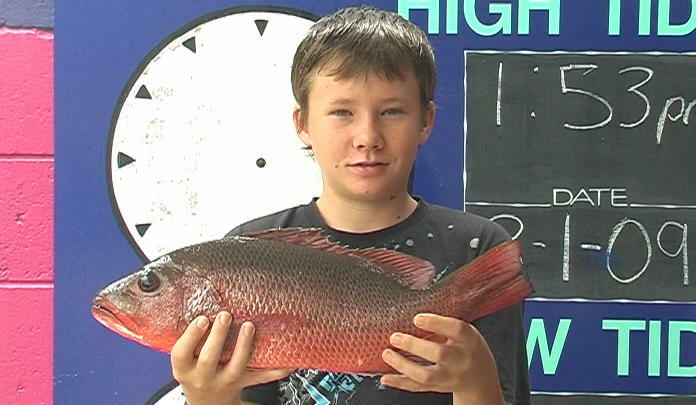 Reports of school jew, trevally and jacks on the high tide at the creek entrances, Cod Hole and top end of the canal. KAWANA: Quality whiting in the lower reaches in the mornings. Trevally and mangrove jacks taking flesh baits and lures between the Wharf and McKenzies bridge. Plenty of bream around the moorings and the canals. Sand crabs and gar reported in the Basin. CALOUNDRA: Flathead, bream and whiting just inside the Caloundra bar. Mangrove jacks in the canals, Coochin Creek and at night along the Boardwalk. Trevally taking lures along the Boardwalk and at Currimundi Creek’s entrance. Ray Nichol fished McKenzies Bridge and hooked this estuary cod on a fresh prawn. 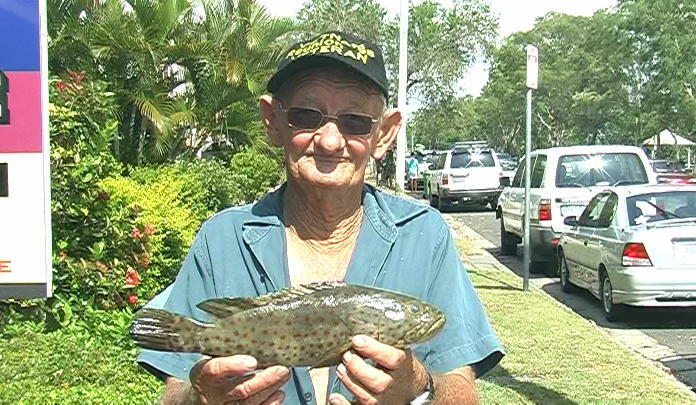 Hashem Sanjar was all smiles when he pulled in this 3kg tailor from Yaroomba Beach. 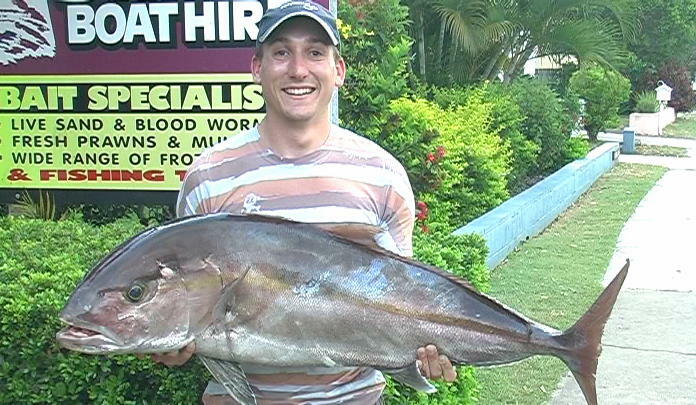 Mark Menzel was ecstatic with this 20kg amberjack from Caloundra Wide. The 'Jack's' were on fire between the Noosa lakes - Warren Gillespie boated these 1.2kg and 1.8kg fish not far from Tronson's Canal. 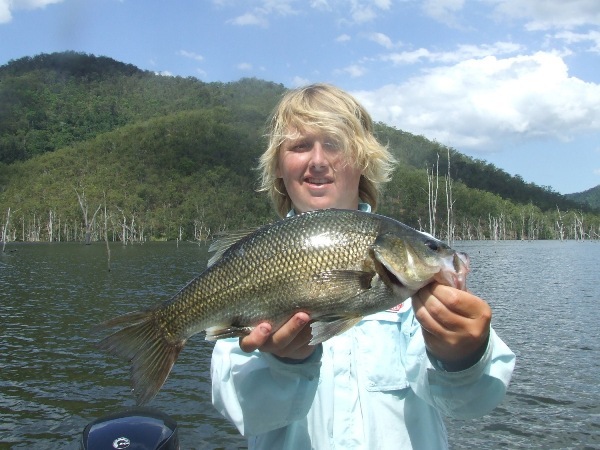 Callum Munro caught and released over twenty bass around the timbers in the lower Yabba Arm of Borumba Dam using soft Jackalls.